India may have stomped all over Pakistan in both World Cup and World T20 but Champions Trophy has been a much closer affair between the two teams. The ‘Men in Blue’ lost to their arch-rivals in the 2004 as well as 2009 edition. If it was Mohammad Yousuf's master class in the former, Shoaib Malik showed his prowess in the latter match and left the bowlers in a state of bewilderment. However, India soon broke the trend by defeating Pakistan for the first time in Champions Trophy during the 2013 edition. On this day four years ago, MS Dhoni's troops defeated their traditional nemesis by 8 wickets at Edgbaston Stadium and topped the group. They would eventually go on to win the tournament. Let us relive the events of India’s memorable victory against Pakistan in the 2013 Champions Trophy. In what was typical of an English summer, rain was in the air at Birmingham. 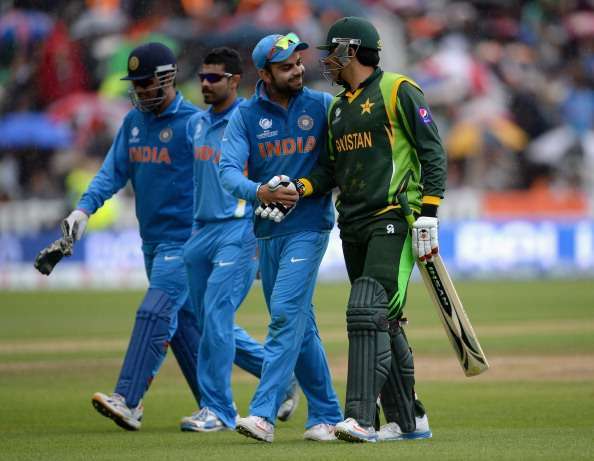 The match would not have any bearing on the fortunes of either side as India were assured of pole position in the group even as Pakistan had already been knocked out of the tournament. However, that did not deter fans supporting both teams from thronging the venue. Dhoni won a handy toss and had no hesitation in bowling first. The prospect of a run chase sounded much better with damp weather in the horizon. While the overhead conditions were murky, the pitch on offer was a soft one. The stage was set for a swing bowler like Bhuvneshwar Kumar to make an impression early in the piece. He did exactly that by getting rid of Nasir Jamshed in the third over of the match. Prior to that game, the opener had reeled off three centuries from four encounters against the same opponents. 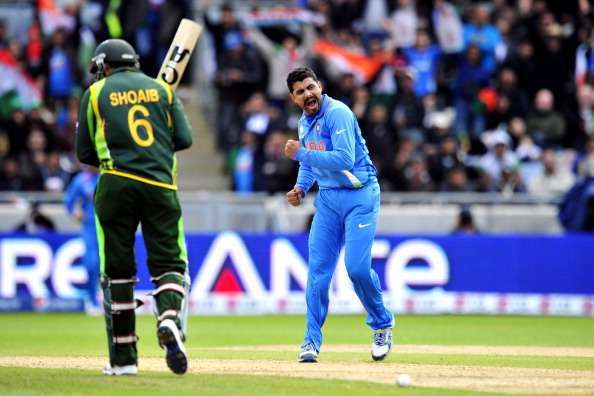 Buoyed by the early wicket, the Indian bowlers maintained their discipline and controlled the run-rate. Before the partnership between Kamran Akmal and Mohammad Hafeez could blossom, light drizzle interrupted Pakistan's momentum. Bhuvneshwar capitalised by dismissing the latter in the first delivery after the rain delay. As he would often do, Dhoni introduced spin from the other end in order to strangle the flow of the batsmen. Ravichandran Ashwin vindicated the decision by inducing an inside edge off Akmal. With Pakistan reeling at 56/3, the onus lay on Misbah-ul-Haq to do his customary repair work. Another rain interruption meant that the game was converted into a 40-over affair. Misbah joined hands with Asad Shafiq and looked to resuscitate the innings. The duo added 54 runs for the fourth wicket before Ravindra Jadeja castled Pakistan’s captain with a well-directed delivery. The breakthrough completely derailed the innings as wickets began to fall in a heap. Shafiq followed suit after India’s newfound acquaintance with the Decision Review System (DRS) helped in overturning the on-field call. Malik did not last long this time as Jadeja trapped him in front. Apart from Umar Amin’s sparkling cameo, the lower-order failed any sort of resistance. A couple of run-outs brought an end to Pakistan’s innings. Despite batting almost 40 overs, they could only reach a paltry total of 165. Chasing a meager target, India’s opening duo of Shikhar Dhawan and Rohit Sharma continued their prolific association by stitching another fifty-plus partnership. While the left-hander took a liking for Junaid Khan’s angle, his batting partner did not mind the extra bounce generated by Mohammad Irfan. Pakistan’s only chance to get back into the contest lay in making use of the new ball. However, the recently formed Indian opening combination batted adeptly and kept their opposition wicket-less in the first ten overs. When it seemed like the traffic was going one-sided, Rohit threw his wicket away by playing an unconvincing shot off the wily Saeed Ajmal. Yet another rain delay brought down the target to 102 from 22 overs. In sharp contrast to the weather on display earlier in the day, the setting suddenly turned resplendent as the sun finally peeked through the clouds. After plundering a couple of boundaries off Wahab Riaz, Dhawan fell two short of his half-century when he lifted a short ball into third man’s hands. But Virat Kohli and Dinesh Karthik knocked off the remaining runs to deliver a clinical victory for India. For his splendid spell which accounted for two of the most fluent stroke-makers in the Pakistan line-up, Bhuvneshwar was adjudged Player of the Match. Upon marching into the knockout phase in style, India went on to lift the Champions Trophy for the second time in their history by vanquishing Sri Lanka in the semi-final and England in the final. On the other hand, Pakistan ended the tournament without winning a single game. This was their second such instance after the 1998 Knockout Trophy.